Mostly when I'm around Max, I think about the stuff he's able to do. Like the other day, he said the word "spaghetti" for the first time (it sounded like "suh-eh-hee" but I knew what he meant), and my heart did this little cartwheel. Guess what he's had for dinner the past five nights? Every so often, though, I get tripped up by something Max is not able to do. Last night my friend Stephanie, who writes the blog Formerly Hot (for the record, she is still hot), posted this photo on Facebook of a project her girls had made. 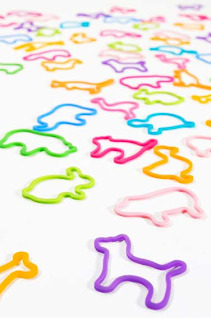 Suddenly, there I was thinking about Silly Bandz, and the fact that Max couldn't use them. They're the hottest thing in Sabrina's preschool class, and she has a few packets of them. I've been amused because it's the first collectible she's into. The first thing I ever collected as a kid, dork that I am, was stationery. Anyway, I hadn't really thought about Max and Silly Bandz until I saw Steph's photo, and realized he wouldn't be able to use them. Max has major dexterity issues. Because he has no pincer grasp (the ability to hold an object between your thumb and pointer finger) playing with something as tiny and squiggly as Silly Bandz would be really tricky for him, if not downright frustrating. I stared at my computer screen and pondered that. My child can't play with Silly Bandz. I mean, yes, Max has plenty of other stuff to enjoy— balls, toy trucks, Shrek figures, purple whatever—but these animal-shape rubberbands are not a possibility. And just for a moment, it seemed so quintessentially wrong that a child would not be able to enjoy a simple thing like Silly Bandz. Sometimes, those little special-needs shocks to the system just sneak up on you. I saw the title of this and totally thought it was going to be about that article Fox News just posted on the potential hazards of Silly Bandz. And Ellen...Stationary? For real? I thought you were my friend...dork! I don't know Ellen...he'd at least like to wear an armfull of purple ones. Give it a try but since Sabrina has them probably all over the house, maybe you have. Don't worry, I used to collect stationary too (but don't tell anyone). That happened to me when Faith had her last G.S. troop trip to a horse barn. All the kids were supposed to try each of the activities of grooming IE: picking out the horses hooves...yeah...not gonna happen with Faith! I was kinda bummed until one of the moms was like "let's get Faith up on this horse!" YEAH she can do that, baby! Max probably wouldn't care about those "Girly" bracelets anyway, eh? Ellen, it's the little tiny things, I think, that are the worst. As for the first collectible of yours being stationary; I collect different papers-to the point that when people go places they bring me home paper :P Dorks of the world unite. WTG on spaghetti Max, yum yum! I really don't understand the Silly Bandz thing, and even had a 7 year old explain them to me. Now I understand it, but I don't "get it." Max can have one of my collections (cp approved) if he would like to have a collection. Ellen, how exactly does one collect stationary? I get it. Thanks for sharing. Plus...I still collect paper. And I will never forget my first set of primary colored stationary back in 1980. I have never heard of these things - I must live under a rock or something. It is amazing how those moments sneak up on you out of nowhere! And isn't it funny how we can get so worked up about it? When my daughter got her g-tube (at one month old, mind you) I was very concerned that she wouldn't be able to eat birthday cake at her first birthday. VERY concerned. Aren't all kids supposed to smash cake in their face when they turn one? I carried on as if her whole life would be ruined by her inability to do this one thing. Looking back now, I have no idea why I cared. She enjoyed sucking on some frosting and looked adorable doing it. I have no doubt that I will have many more moments like that as she gets older. I think it comes with the territory. 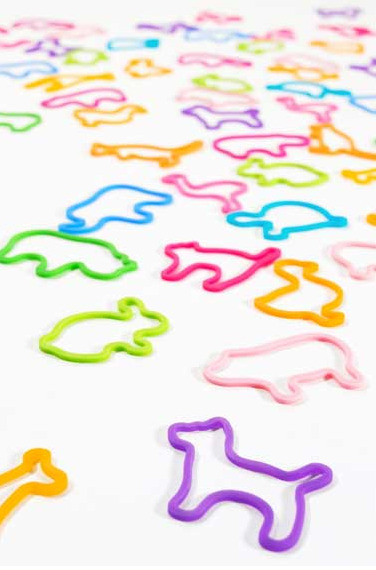 Oh my gosh do they sneak up on you...and it's usually the smallest, weirdest things...like Silly Bandz. I totally get it. I can get weepy over a cute pair of flip flops...because Olivia can't wear them...and Silly Bandz...she couldn't do that either!! Eh.....an awful lot of money for two dozen misshapen rubber bands, IMO! That's a frigging Happy Meal! I don't know if these shocks are just limited to special needs kids--I've seen parents of neurotypical little children who are hysterically DETERMINED that their child be a football star or a basketball hero, when the kid is the smallest one in his class, unathletic and TOTALLY unmotivated. They're screaming at the kid, the coach, and believing that through sheer force of will, they're going to turn their Erkel-child into the pitcher for their local major league franchise. Or, they want their kid to get all A's when he's just not the sharpest knife in the drawer, hates math or english or whatever, and Harvard just isn't in his future. In short, it ain't happening! Each kid lives in their own reality; it is sometimes a challenge as parents to bite one's tongue and not push kids into doing things that we did in our misspent youth (or things that we would have done, only we were too scared/unpopular/clumsy/unqualified), because, after all, aren't children here to reflect OUR glory and fulfill all OUR dreams? (I am being sarcastic, here, for anyone who is irony-impaired!). It's totally understandable ("normal," in fact) to wish for a different reality (and that wish certainly comes out of LOVE), but it's important to NOT DWELL ON IT, because kids do pick up on how parents feel, and they, being such little parent-pleasers, will try like hell to live up to parental expectations, even unspoken ones, and sometimes can get anxious if they perceive that they are falling short and aren't measuring up. I refuse to think about the negatives--life is way too short and it is way too easy to get depressed about "it-shay" that you can't change no matter how hard you wish for it. It's also way to easy to obsess about crap that doesn't even matter to the kid(s) in question. I just flat-out REFUSE to go down that road--I don't have the time or the energy for the "woulda-coulda-shouldas" in life (or the will to pull myself out of the muck if I get wrapped around that axle!). I make a conscious decision when I put my feet on the floor every morning that I am going to accentuate the damned positive--even if it KILLS me! Once you get yourself into that mindset, it works--really! We're unique, we have the BEST family, and aren't we LUCKY to be US, that's my attitude! Have had and do have the same experiences and issues. My first thought - get him a necklace he can somehow put the sillybands onto and then he's got them around his neck to enjoy, share w. others etc. If he wants to. I'm sure he'd enjoy the purple ones. Flip Flops are a biggie too and b/c of our experiences we don't take anything for granted and can be brought to the greatest heights by something as simple as a genuine smile (or at least I can). I hear you Ellen. I get it. It sounds like a lot of us do. Have a super holiday weekend. Thanks, all. 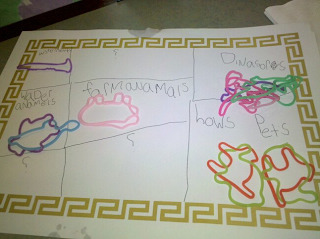 There are different alternate/adapted ways Max could play with Silly Bandz. It just struck me, though, that he couldn't pick one up on his own. I'm over it, and now recovering from last night's drama! Felicia, woman, you need your own blog. You always have the wisest things to say! Sarah: This is how I collected stationery as a kid—I'd get a box of, say, Snoopy stationery at the store. Then I'd trade pieces of that for other stationery kids had! Seems so quaint now, in these e-mail times we live in. Monkey Boy is big into Silly Bandz now, too. I really don't get the fascination. Then again, the colored bottle caps game that was popular during the early 90's were pretty silly as well. Anyway, we've been using the popular rubber bands as a way to sneak in some OT. Monkey practices using Lefty to stretch them into and out of shape. He'll probably never master the left - handed rubber band snap, but no worries. FWIW, Sasha's school just banned Silly Bandz, because too many kids were getting pissy over them and cliquey and fighting. Feh. Sorry that one snuck up on you, and I hear you. But Max isn't missing anything on this particular trend. that is so sad...........it broke my heart to hear a cute little kid not being able to play with a simple rubber band........... god bless Max.